We believe in whole body wellness...Our on-site doctor will help clients achieve that. Tampa Bay wellness seekers can now find care under one roof. That’s the all-inclusive niche of Driven + Sponaugle Wellness Studio (SWS), a hybrid wellness practice that opened its doors Saturday, November 4 at the corner of Swann and Armenia in Hyde Park. Driven + SWS offers Tampa personal training, acupuncture and massage as well as chiropractic services by Dr. Sarah Sponaugle. Dr. Sponaugle calls the Driven + SWS collaboration ‘a perfect fit.’ Exercise, she says, is a key element in healing for many of her patients. For a doctor to simply walk across the hall to discuss a patient’s progress with their personal trainer or massage therapist is invaluable. Sponaugle’s inclusion also coincides with the introduction of Styku, an infrared body screen that eliminates the need for skin calipers and other body composition measurement tools. Driven + SWS is the first Bay Area location to feature Styku, which provides extremely accurate data for body fat and muscle density. To be scanned, a client stands on a turntable for about 30 seconds as the infrared body screen creates a 3-D image. The result is more than a revelation of current body fat percentages and body shape – posture is measured as well. That’s where Sponaugle comes into play. The scan is used for the development of whole treatment plans and as a stand-alone diagnostic tool. Even small changes are visible thanks to Styku, so personal training regimens and accompanying treatment protocols can be continually monitored. 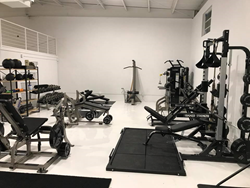 The Driven + SWS focus is on stability, mobility and rejuvenation of the body at a central private South Tampa studio. With this balanced approach, personal trainers and practitioners strive to improve their clients’ overall quality of life. For more information about Driven + SWS or Styku or to schedule an introductory personal training or wellness consultation, visit http://www.drivenfit.com.